A producer for the SyFy show "Haunted Highway" will be featuring a unique monument from Iowa City on its next season: the infamous haunted Black Angel grave monument. "Haunted Highway" is a show about landmarks around the nation that are viewed as haunted. Jack Osbourne is the host for the show. The film crew for "Haunted Highway" will be sharing a very interesting story with viewers. 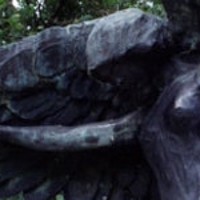 This is the story of the infamous Feldwart grave monument, also known as the Black Angel. The statue was put up in 1912. Most of the stories that contribute to the eeriness of the statue involve the woman herself. Stories have been passed down about the grave of Theresa Dolezal Feldwert, Czech immigrant and her son Eddie and her husband Nicholas. She lived an unusual and impoverished life as an outcast. The stories have grown for a very long time, and have formed a very eerie air surrounding the unusual Iowa City landmark. People have been brought from all over the country to see the statue, which gained a reputation as being haunted. 30-year-old Robert Campagna is a producer living in Los Angeles, but has lived in the Iowa City area and knows of the infamous Black Angel statue. The filming about the Black Angel is set for early 2013. Residents of the area will be interviewed, experiments will be conducted, and the film crew will be spending a night in the cemetery. The Black Angel story will be featured on the second season of the show.